One of my primary areas of interest is textiles. 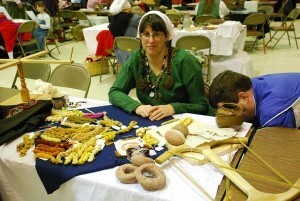 I can do just about any craft with string, except knitting and Anglo-Saxons did not knit. 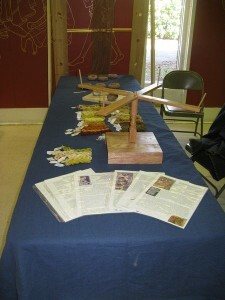 Over the years I have made as many of the textile tools as I can find research. I have made a warp weighted loom and all of the equipment that is needed to make it work. 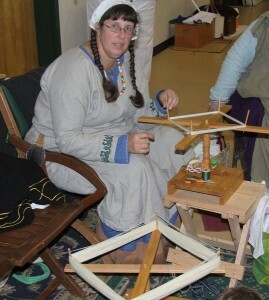 I have learned to make needles and taught at Pennsic. Most of my tools are made with modern equipment, but perform as they would in period. I do not have the patients to perfect my woodworking skills to the quality I would need to make what I see in a picture or read in an archaeological report. At times I have been pleasantly surprised that a period construction technique is quicker or it works better. I made an Oseburg Rotating Swift (well I have made a total of 4.) It works great and can be taken apart for transport. I use it to skein yarn for dye projects.